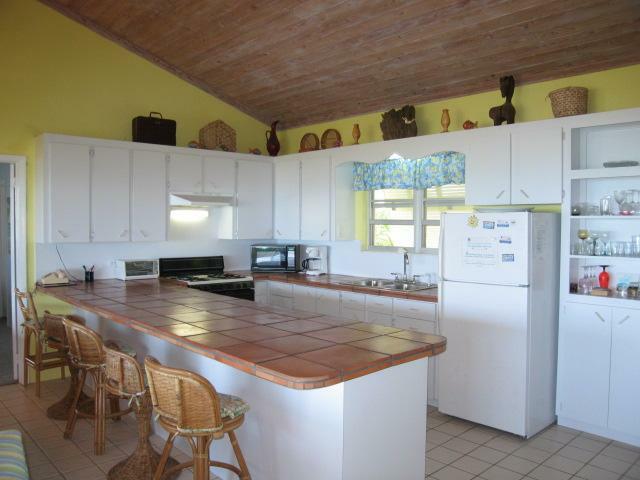 Sunnyside Beach Villa is lovely, spacious, light, and airy beachfront rental villa directly on a beautiful stretch of sandy beach in Spanish Wells Eleuthera Bahamas. 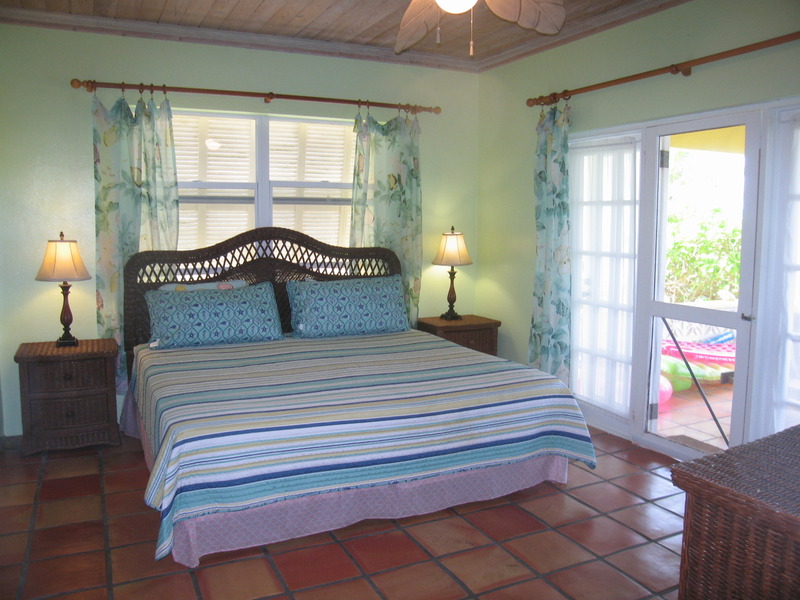 The villa rental offers three master suites - each offering its own bedroom, full bathroom, and a 9' expanse of French doors leading onto a spacious covered verandah with excellent views of the beach, sea, and surrounding islands. Likewise, the large, airy, open, great room with cathedral ceilings offers an outstanding beach view from a 16' expanse of sliding glass doors, which also lead unto the large covered verandah overlooking the beach. 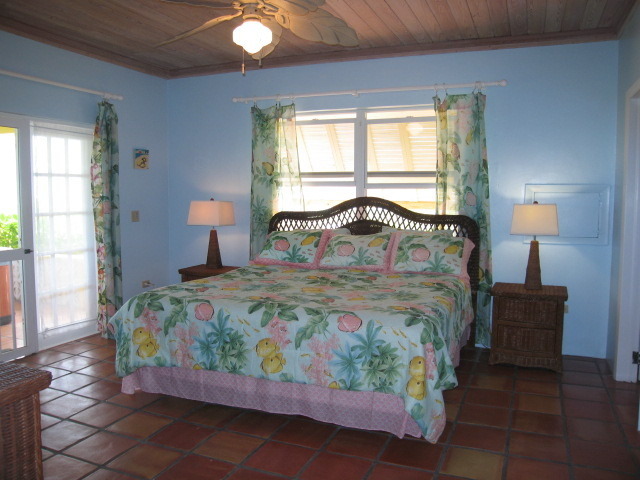 All renters agree, this villa offers the best beach and ocean views on the entire island from every room. They call it "a million dollar view." This villa is bright, cheerful, and comfortable. 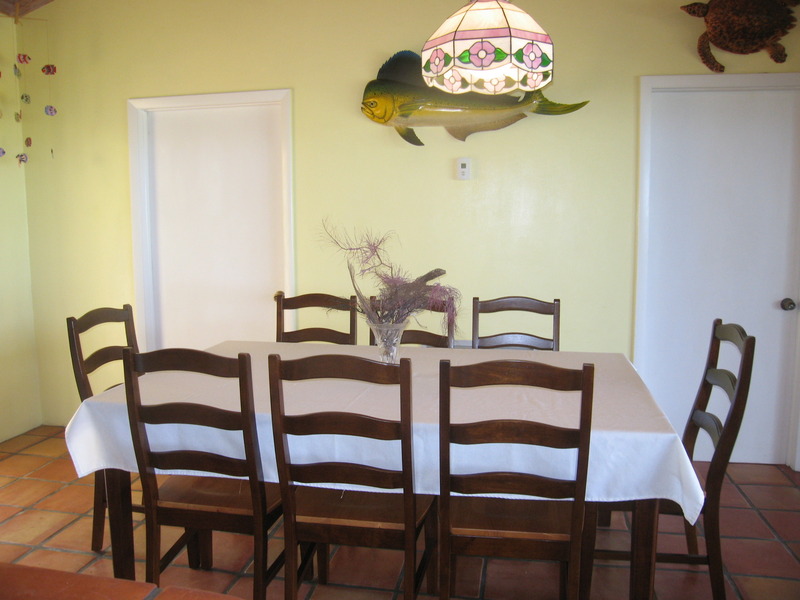 This villa rental offers all amenities including a fully-equipped kitchen, spacious living area, open kitchen, central A/C, ceiling fans throughout, cable TV, and washer/dryer. It also offers a large romantic hot tub on the beach front verandah and a hammock on the beach - great spots to relax with a cool drink after a hard day of fishing, snorkeling, or beachcombing. 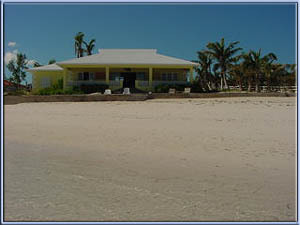 Renters here have delighted in catching many bonefish directly in front of Sunnyside Beach Villa. 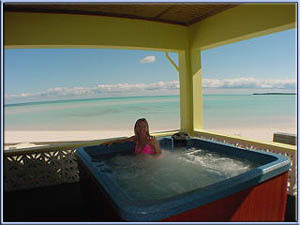 There is also terrific snorkeling, fishing, and diving available in Spanish Wells. Sunnyside Beach Villa is located in a secluded area, but just a few minutes from the conveniences of Spanish Wells including well-stocked grocery stores, restaurants, home bakeries, a nautilus gym, marinas, a well-stocked liquor store, water front bars, and more. Spanish Wells is the fishing capital of the Bahamas, so there is all kinds of fresh seafood available. 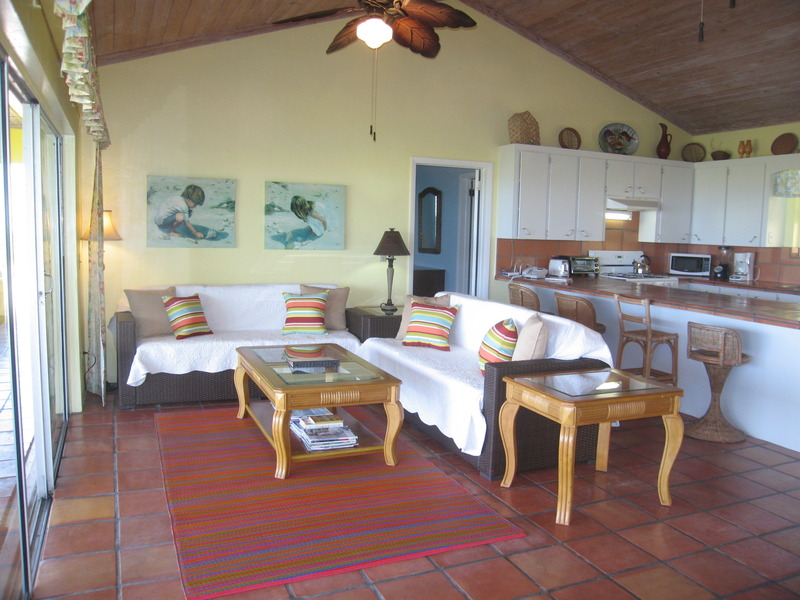 This beach villa rental is a great choice for two - four couples traveling together, one couple looking for a romantic getaway, or a family of up to eight adults and three small children. Beds: 2BR/2BA main house: 2 kings, triple bunks. 1BR/1BA guest suite: 1 king, 1 queen. Please note that the attached 1BR/1BA guest suite is never rented by itself, and is only opened for guests when there are 6 or more paying guests. Rates for 4 persons in 2BR/2BA main house: $1895/wk. Oct. - Nov.19. $2395/wk. for November 20 - January 15. 2 week minimum rental + 10% surcharge required for Christmas / New Years. $2295/wk. for January 16 - August 16. 10% surcharge for Easter week and any weeks in March. $2195/wk. for all other dates. Each add'l person is $200/wk. Max. 11 persons. Please ask about discounts for stays of two or more weeks. There is a $700/wk. refundable damage deposit required with final rental payment for the main house and a $400/wk. refundable security deposit for the guest suite. Note: The rental rates are for accommodations at Sunnyside Beach Villa only. The hot tub, bicycles, ocean kayaks, and other extra equipment are offered free of charge for the use of guests at their own risk. Note: An energy surcharge is applicable on this rental for any electricity bills in excess of $100/wk in the main house & $25/wk. for guest suite (if in use), so please use electricity wisely. 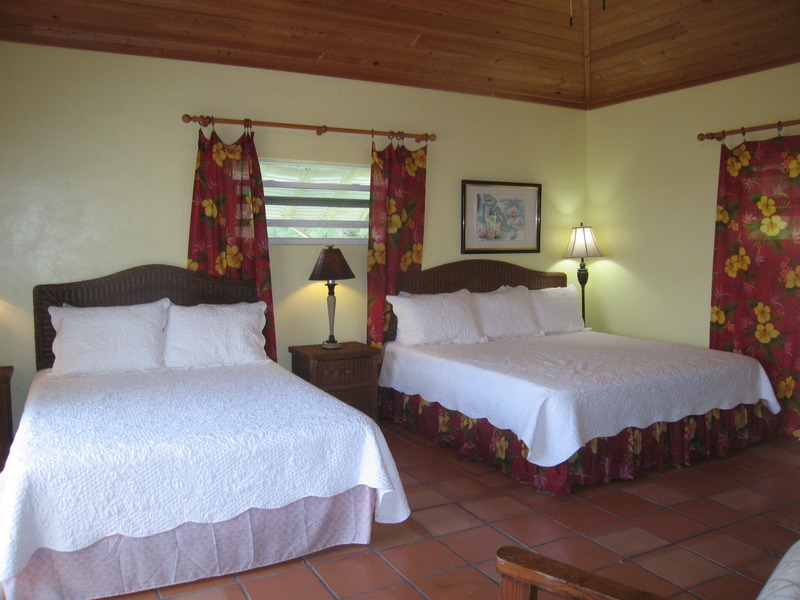 Cleaning fee $100 for up to 4 persons, $150 for 5 - 7 persons, and $200 for 8 persons or more per stay .Sunnyside Beach Villa accommodates a maximum of 8 adults and 3 small children. Larger groups, gatherings, parties, dinners, weddings, receptions, etc., of more than 11 persons are not permitted at Sunnyside Beach Villa without prior written consent and additional fee paid. 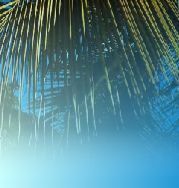 Copyright © Bahamas Vacation Homes, Ltd.